Cantina Poggio Turri is located on a bright hillock near the medieval town of Montefalco, right in the heart of the Umbrian countryside; among grapevines, olive tree groves and cornfields. A special and romantic atmosphere lives again at the Cantina Poggio Turri thanks to the Tocchis’ farming tradition and their ability to combine old and modern techniques: wooden barriques, iron containers and huge oak barrels. In constant search for a high quality product, Cantina Poggio Turri carefully studied and followed its grapevines in every single period of their life: from the choice of the place, structure and plant to the pruning. The grapes are hand harvest, put in small boxes and carried to the laboratory where they are pressed soon. In 2000 Damiano and Domenico Tocchi started to work on their family lands and to produce wine. In that precise moment, a journey inside the Universe of wine began also thanks to their sons’ help, their passion for wine and the lucky position of their lands. With its 70 hectares of land, Cantina Poggio Turri is characterised by olive trees, sown ground and grapevines mainly producing Sagrantino wine (Company map). Cantina Poggio Turri is situated along the well-known Strada del Sagrantino (The Road of Sagrantino), 2 km far from the centre of Montefalco and 350 mt above the sea level. Next to these centuries old olive tree groves and these Sagrantino grapevines, there are Sangiovese, Merlot, Cabernet Sauvignon, Grechetto and Chardonnay grapevines. 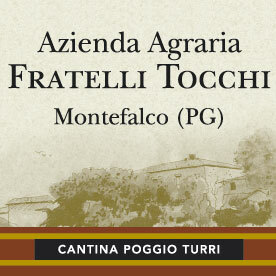 The first production of Cantina Poggio Turri dates back to 2003 while the first bottles of Montefalco Sagrantino were broached in 2005. This company annual production amounted to 150000 bottles which are destined both for the Italian and for the Foreign markets.